Those of us in the Americas who think of predatory ant-killing ants usually imagine the specialized army ants. These nearly blind insects roam in stereotypically large columns across the landscape, attacking prey colonies with forces of thousands. Army ant raids can be spectacular, enough so to raise the question of just how such an unusual behavior could have arisen from more typical ant ancestors. Army ants didn’t evolve their mass-raiding predation instantaneously (in spite of creationist assertions otherwise). Rather, they belong to a larger group of ants, the so-called “Doryline section”, whose members exhibit a great diversity of ant-killing strategies. We can see how intermediate army ant lifestyles work from example. Hundreds of present-day species, especially in Africa, Asia, and Australia, make a living at them. Many of these older lineages have decent eyesight, stationary colonies, and raid in rather civilized small parties. Apparently a taste for ants came first, accompanied by group foraging, while the massive raids and nomadic lifestyle followed in only a subset of more recent species. Below is a short photographic essay covering a Cerapachys larvatus raid Mrs. Myrmecos & I happened across in the Australian Alps last year. We don’t have ants quite like these here in the United States, so our chance observation of an unfolding raid was a rare treat. Mrs. Myrmecos searches for ants along a rotting log. Our Cerapachys subjects appeared over the far end at the left, a dozen ants moving erratically along the top of the log. The genus Pison refers to a small group of crabronid wasps containing about 200 species worldwide. These insects raise their young on a diet of living, but paralyzed, spiders. Paralyzed spiders don’t decay, staying fresh while the wasp grubs eat them alive. It’s a pretty gruesome death, being chewed up in the dark and unable to move. Not that spiders themselves kill humanely. What goes around comes around, I suppose. A stash of paralyzed spiders. The Pison egg on a tasty arachnid. 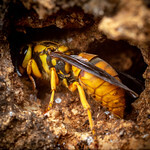 After I disturbed the nest, the wasp rebuilt it and promptly filled the cell with new spiders. A Paropsisterna sp. eucalyptus leaf beetle larva everts its hindgut to expose its volatile defensive chemicals. Among the more conspicuous insects we encountered during our Australian travels were Paropsisterna eucalyptus leaf beetles. Most trees I looked at in southern Australia hosted clusters of pudgy yellow larvae hanging around in plain view, munching on the aromatic leaves in happy abandon. The beetles have good reason to be seen: they are toxic. Unusually among insects, this beetle’s arsenal includes hydrogen cyanide. By advertising this fact to would-be predators, they avoid becoming a bird’s lunch. An aggregation of Paropsisterna sp. eucalyptus leaf beetle larvae. source: Moore, B. P. 1967. Hydrogen Cyanide in the Defensive Secretions of Larval Paropsini (Coleoptera: Chrysomelidae). Australian Journal of Entomology 6: 36-38. Finally! Working up the insect images from my recent Aussie trip took longer than I thought- probably because I pay more attention to post-processing now that I’ve become a Lightroom convert. Happy St. Paddy’s day, everyone! Doleromyrma, a new (for me) ant right under my nose! I didn’t think much of it. The insects resembled- in appearance and odor- the ubiquitous Tapinoma that is so abundant elsewhere in the world. That I stopped to photograph it at all has more to do with, what- that I’d lined up the aesthetics of solid ant nest shots? I can’t even remember. It certainly wasn’t any realization that what I was shooting was perhaps interesting. 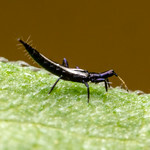 Yet looking at the photos yesterday evening, something didn’t quite add up for a Tapinoma. The petiolar node was scalar, and there weren’t many records for Tapinoma in that region. A Google image search turned up a few images of preserved specimens, but not a single photograph of a living Doleromyrma. Am I really the first person to photograph this common ant in the field? Perhaps so. Or at least, I may be the first person to identify the live photos as such. So often it’s the little brown things, the ones I never think twice about, that end up being the interesting stories. Note to self: stop pre-judging the insects. Anonychomyrma workers aggressively defend the carcass of a carpenter ant they have found from would-be usurpers. Several years ago Australian myrmecologist Alan Andersen proposed a set of categories for arranging ant species by “functional group“. These groups carried names like “cold-climate specialists,” and “subordinate camponotines,” and they were widely adopted by ecologists for their ease of use. The scheme also drew considerable ire from taxonomists, especially since the categories were somewhat arbitrary and many blended behavioral and taxonomic attributes. Another issue was that these groups, crafted from Andersen’s knowledge of the Australian fauna, didn’t always make sense outside of Australia. Certainly the “Dominant Dolichoderines” were aptly described on the great southern continent. Any stray bit of picnic lunch in Australia is nearly instantly covered by ravenous and aggressive Iridomyrmex. But do the same functional categories apply to the more timid dolichoderines of Europe? In any case, the Aussie genus Anonychomyrma fits the bill of a dominant dolichoderine. Here are couple recent photos of Anonychomyrma defending their title. Anonychomyrma workers cooperate to transport the body of a dead carpenter ant. Portrait of an Anonychomyrma worker. OMG!!! I’m currently revising this genus – Loboscelidia. I’ve never seen them alive. We have no idea how they make a living except for one obscure reference to rearing one from a walking stick egg. Do you have any other photos of it??? This is a male. Twitter got the wasp in front of the right set of eyeballs within a day after I posted the photo. Now we not only know what the insect is, but we know- after some additional sleuthing- these may be the only live photographs ever taken of this species, genus, and subfamily. A Myrmecos exclusive! To make my life complete, now I just need instant image-processing and tweeting capabilities from remote tropical jungles. Had I known in the field that this bizarre animal was a rare and potentially valuable discovery, I would have devoted more than two minutes to it.